It's the 21st century, and all is right with the world. Or so it seems. Vice President Charlie Haskell, who will travel anywhere for a photo op, is about to cut the ribbon for the just-completed American Moonbase. The first Mars voyage is about to leave high orbit, with a woman at the helm. Below, the world is marveling at a rare solar eclipse. But all that is right is about to go disastrously wrong when an amateur astronomer discovers a new comet. Named for its discover, Tomikois a "sun-grazer,"an interstellar wanderer with a hundred times the mass and ten times the speed of other comets. And it is headed straight for our moon. In less than five days, if scientists' predictions are right, Tomiko will crash into the moon, shattering it into a cloud of superheated gas, dust, and huge chunks of rock that will rain down on the earth, causing chaos and killer storms, possibly tidal waves inundating entire cities...or worse: a single apocalyptic worldwide "extinction event." In the meantime, the population of Moonbase must be evacuated by a hastily assembled fleet of shuttle rockets. There isn't room, or time enough, for everyone. And the vice president, who rashly promised to be last off ("I will lock the door and turn off the lights"), is trying to figure out how to get away without eating his words. 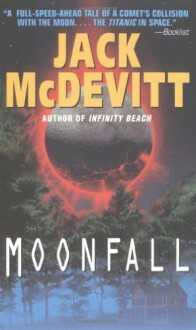 In Moonfall,McDevitt has created a disaster thriller of truly epic proportions, featuring a cast of unforgettable characters: the reluctant Russian rocket jockey entrusted with the lives of squabbling refugees; the woman chosen to be first on the moon; the scientist who must deflect the "possum" (POSSible IMpactors) knocked from orbit or witness the end science itself. And at the center of it all is Charlie Haskell, the career politician who discovers his own unexpected reserves of only himself and his country, but for all humankind. Moonfall,is a spellbinding tale of heroism and hope, cowardice and passion played against the awesome spectacle of human history's darkest night.